What was Henry David Thoreau’s philosophical contribution? Henry David Thoreau (1817–1862) was a naturalist, writer, school teacher, and pencil maker (he invented the pencil with an eraser on its end). He was born in Concord, Massachusetts, attended Harvard, and then returned to Concord. He was not a political reformer but is famous for his civil disobedience in not paying the poll tax (he felt it supported slavery and the Mexican-American War, both of which he found objectionable) and for helping runaway slaves escape. Thoreau is best known for the two years he spent in a hut he built on Walden Pond, an experience he describes in Walden (1854). His lifestyle there and protest against materially driven lives of “quiet desperation,” set an aesthetic ideal for many American intellectuals in generations to come. Thoreau’s love of nature and ideals of simplicity were in themselves a form of revolt against industrial life and have been reclaimed in intellectual revolts against post-industrial life. However, Thoreau’s striking intellectual contribution is not the ideal of “roughing it” in nature, because his time at Walden Pond, punctuated as it was by frequent visits from his literary friends, as well as his own habit of walking back into town, was hardly a withdrawal from society. Indeed, the hardships he endured scarcely compared with the hardships of pioneers and homesteaders farther west, who lived in rural poverty out of necessity rather than choice. By contrast, Thoreau set a different example for a different American group of strivers. He combined a naturalistic aesthetic of simplicity with cultural criticism and intellectual creativity. This “life of the mind in the woods” stands in stark social class and regional contrast to the genuinely hard-scrabble background of several of the early twentieth century pragmatists, as well as with their efforts to build a broad community and support democratic social interactions through writing and public speaking. But both Thoreau’s privileged love of nature and the pragmatists’ more common touch represent a cultural sea change from much of the thought discussed in the salons, drawing rooms, and formal church -like architectural settings of Europe. 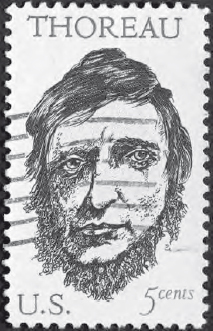 A stamp depicting naturalist philosopher Henry David Thoreau (iStock).